Vibration Reduction (VRII) minimizes the effects of camera shake, allowing handheld shooting at up to 4 shutter speeds slower than would otherwise be possible, assuring dramatically sharper images. 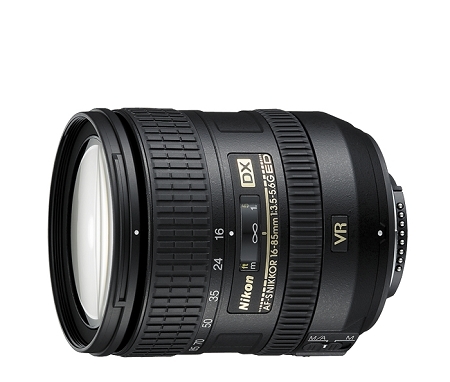 Vibration Reduction is engineered specifically for each VR NIKKOR lens and enables handheld shooting at up to 3 shutter speeds slower than would otherwise be possible, assuring dramatically sharper images. Two ED (Extra-low Dispersion) glass elements offer superior sharpness and color correction by effectively minimizing chromatic aberration. Exclusive Nikon Silent Wave Motor (SWM) enables accurate, high-speed and quiet autofocus operation. Three aspherical lens elements virtually eliminate coma and other types of lens aberration even when used at the widest aperture. Close focusing distance to 1.3 feet throughout the entire zoom range. DX lens optimized for crop sensor cameras, contact us with any compatibility questions.